Posted on October 9, 2018 by Kelly M.
Still no frost, not even a night in the high thirties. This is unusual, as our low lying fields usually get zapped in the last week of September or first week of October. 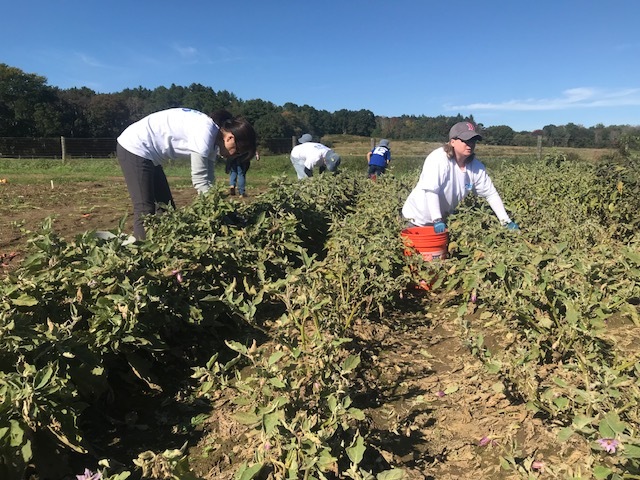 We expected a frost last Friday night, and so worked that afternoon with 20 volunteers from Shire biotech to scour the eggplant and tomato patches in a last call harvest. Shire volunteers then helped us bring in the last of the popcorn crop, and they even had time to dip their toes into the quicksand of the sweet potato harvest—don’t worry; they made it out alive! 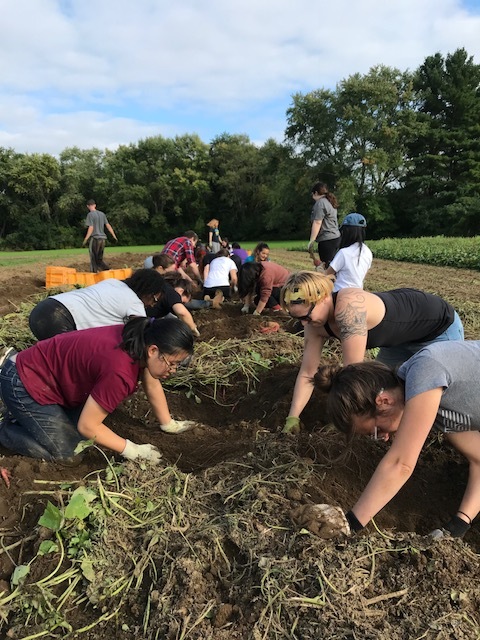 We continued mucking around in the sweet potatoes the following afternoon with 22 students from Brandeis. While it may look like we’re having a fist fight with the soil, we mean it no harm; though I can’t say the same for it, we end each session dazed and badly in need of a nap! And even with all that good help, we’re still only a third of the way through the patch, having brought in over half a ton of sweet potatoes. 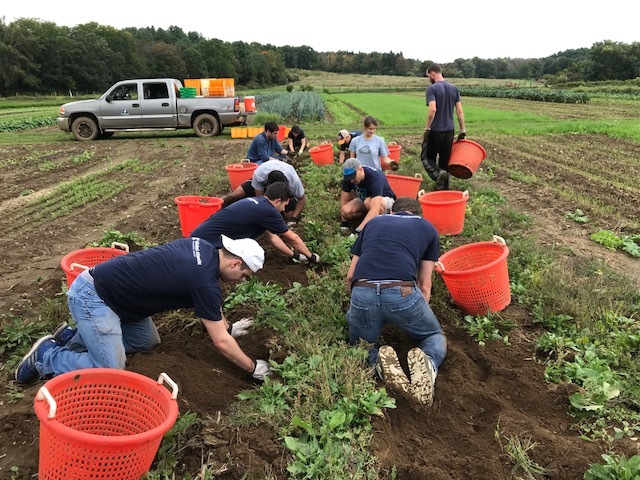 By way of comparison, 12 volunteers from Global Atlantic helped us harvest 1,100 pounds of potatoes in only an hour this past Thursday. The soil in the potato patch is lighter, and the plants have the good sense to develop their roots in a neat bundle in the space directly below them. Thank you, kind potato plants, and thanks to the volunteers from Global Atlantic, who also helped us harvest peppers in anticipation of that frost that never came. But looking ahead, a frost seems likely for our fields this coming Saturday night. We’ll continue harvesting as if that were the case, and you may see row covers going up to protect late season greens. 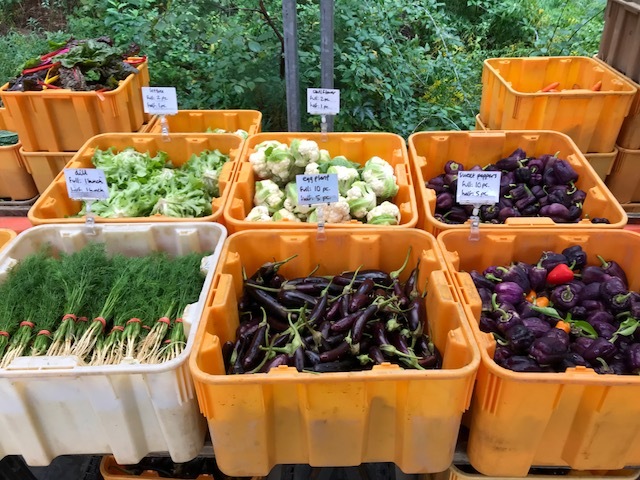 In the meantime, we’re taking advantage of the warm weather and so will have a mix of summer and fall crops available at the stand, in the CSA shares and at market this week. This entry was posted in Farming, Uncategorized and tagged crops update, csa, drumlin farm, farming, farms, local, volunteer on October 9, 2018 by Kelly M..